Melhor Localização Del Mar Grande pátio na areia 18º. Maravilhosamente remodelado à beira-mar. 3 quartos, 2 banheiros. Na areia, esta casa apresenta um grande deck à beira-mar, pisos de madeira, bancadas em granito, novos aparelhos, garagem para dois carros e dois lugares de estacionamento adicionais. O mestre tem rei e banheiro privado. Segundo quarto tem rainha e gêmeos. O terceiro quarto tem rainha e gêmeos. Utlility com lavadora e secadora. Proibido fumar. 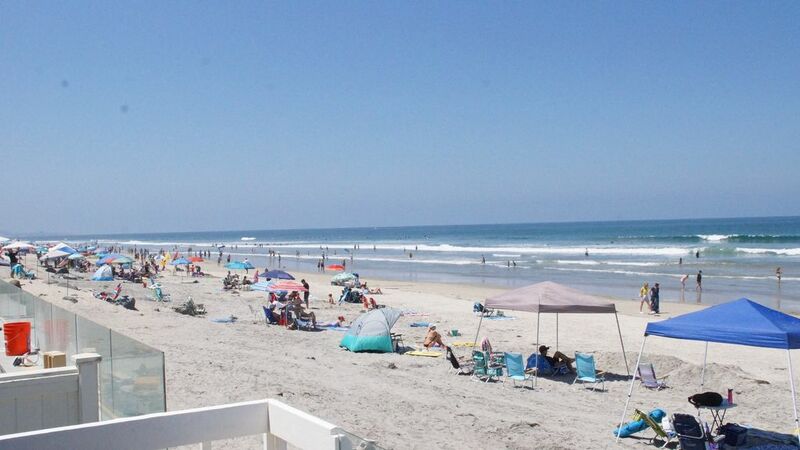 Enjoyed beautiful weather and lovely home right on the beach in Del Mar! Way better than Ohio weather! We had a great time visiting our son who lives in La Jolla! The house was clean upon arrival and check in was easy. The kitchen is well equipped for preparing food. The location is perfect as it is within walking distance to restaurants and shops but walks on the beach were the best! Some evenings were spent playing board games at the kitchen table. It is a short drive to visit and see some great sites such as the La Jolla Cove, the San Diego Zoo, the USS Midway and the UCSD campus. Ron was always quick to answer any questions when I was preparing for our trip. Overall, we had a positive experience and are hoping to return over the next few years! Once again, our family had a wonderful time at the 18th street beach house. The kitchen has everything you need to make home made meals and enjoy on the deck over looking the ocean. The BBQ was well used by our family after a day on the sand. Waking up in the morning and being able to walk up and down the beach with coffee in hand is such a treat. Even though the weather was a bit overcast for some of our stay, the water was warm and the view and sounds of the waves were lovely. We walked to Posiedon and Jake's restaurant for special dinners/lunches. A relaxing and homey feeling for our whole family of adult children. Perfect vacation house for our family. We have two young daughters and rented the home for 5 nights before school started (Labor Day weekend). It’s just like the photos (except better in person due to great natural light in the common spaces). The star, of course, is the location. Our girls loved waking up and running out to the water. The deck is very large, has great views, and is very functional and easy to keep clean. We ate breakfast, lunch and dinner out there (and drank wine once the girls were down). The house is a block from Posidon and Jake’s (we’d get takeout for dinner and eat on the deck) and a short drive (or long walk) to the main drag. Couldn’t recommend the house more, particularly for families. Last note, Ron was very nice and extremely responsive when we had questions. Great host. We hope to come again next year! My family and I have been vacationing in Del Mar for 33 years. This is the best house we’ve rented so far! We traveled from Indiana to Del Mar for oldest Grandson's graduation. I wanted the whole family to be able to spend time together and Ron's beach house was just perfect. It was comfortable but not so "fancy" that I had to worry about the younger grandkids accidentally ruining something. So I could relax and enjoy the week on the beach and I certainly did. I never left the beach the entire week. Brought clothes for dinners out and never wore them. We just enjoyed staying at the beach and grilling our meals. The other family members who live only 10 minutes away came every day and we had such fun beach time and then played board games, played cards and watched World Cup Soccer Games. It was exactly what I wanted. Everything we needed was there. Nobody wanted to go home and they all want to do this rental again. The only thing I would suggest is replacing the area rug in the TV area. So looking forward to coming back.